After several people often asked me about audio pass-through, and 4K video support on mini PCs, with some suggesting adding a donation button to my website, I decided to start a crowdfunding campaign to raise funds for an AV Receiver and a 4K TV by asking for donations and selling some samples I used for review. Thanks to the great help of my readers, I managed to get enough money to buy LG 42UB820T on Lazada for 19,610 Baht including shipping (~$600) via 10% coupon I got in a newsletter, as well Onkyo TX-NR636 7.2 channel receiver in a local shop in Chiang Mai (Sahapanich). I’m still waiting for the speakers, so I’ll start by reviewing the TV. 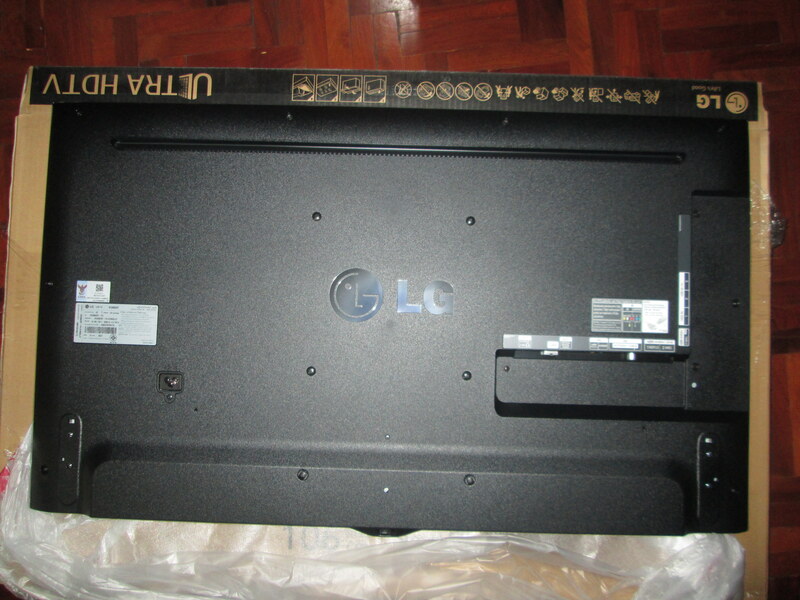 This model is sold as 42UB820V in Europe, and 42UB8200 in Hong Kong and probably other markets. Don’t overestimate sellers technical knowledges of products. Many times they don’t really know the details of the products they sell. The seller told me the current TV I wanted to buy did not support HDMI 2.0, and I had to purchase a more expensive model…. Even the manufacturer site may be wrong, as the Thai website listed 42UB820T as only providing 3 HDMI 1.4 input. Online shipping in Thailand: Lazada (Paypal accepted) and Cdiscount seems to have very good deals online, and priceza.com can be used to compare prices on online shops in Thailand. HomePro also has an online shop called directtoshop, and this is where I purchased Pioneer S-11 speakers. LG has a service center in Chiang Mai, while Onkyo and other AV receiver manufacturers do not, which is why I purchased the TV online (1-year warranty), and the AV Receiver in a local shop (3-year warranty). But let’s go back to the TV. 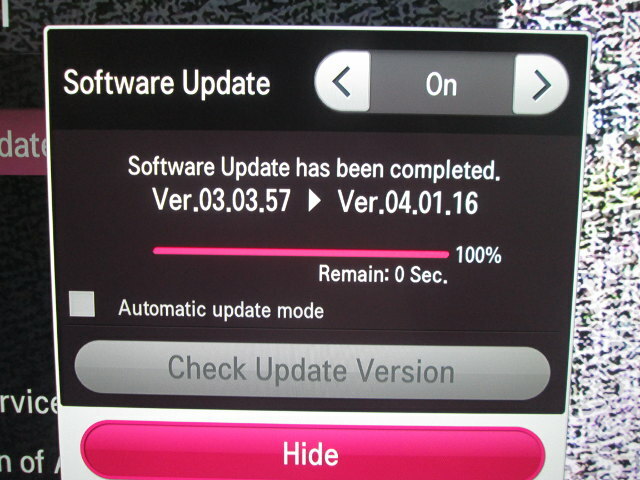 I’ll unbox it first, explain about the first time setup, go through the user interface, and test it as a media player. 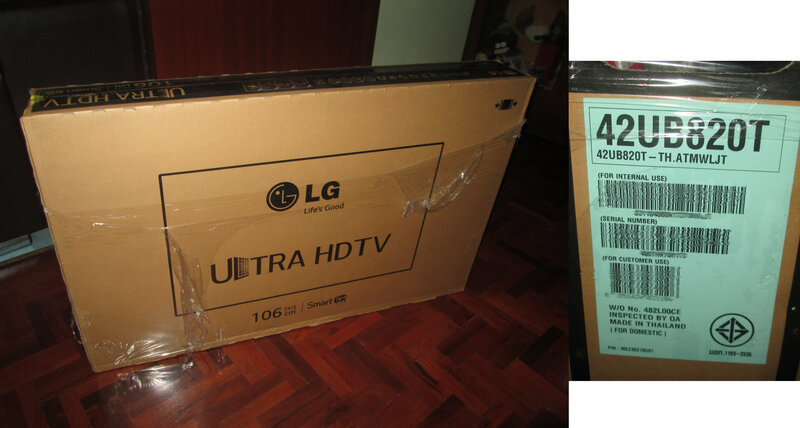 Lazada sent the TV via TNT courier, and I received it within a couple of days in the large box below. 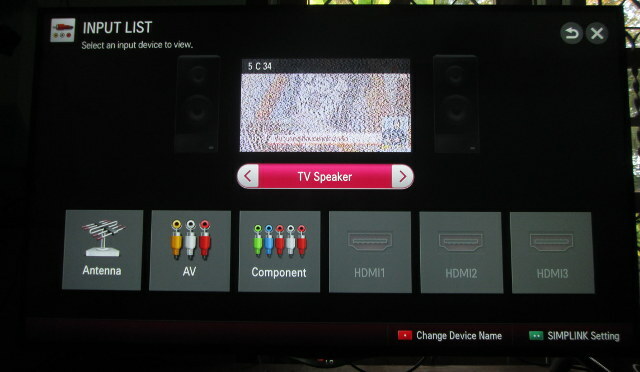 Before getting to the TV itself, let’s check out all the accessories provided with the television. Models that support 3D (e.g. UB830) should also come with one or more pairs of cinema 3D glasses. The Quick Setup Guide, User Guide, and Owner’s Manual can also be downloaded online. The IR remote has more buttons, but 99% of the time I’m just using the magic remote, and it’s just great to use, and I’m used to playing with such remote with the Mele F10 models. The key difference is that to enabled the mouse pointer, you just need to shake the remote, and after a while or when using the arrow keys it will revert to remote mode. I give high marks to this remote control, and it also features a microphone for voice input. That’s the back panel of the TV, where you’ll find the connectors, mounting points for the bases, 200×200 mm VESA mount, and at the bottom in the middle a Joystick button. It’s used to turn on/off the TV, adjust the volume, change channels, and access settings, but unless your remote is broken, you don’t really need to use it at all. Some remote control and “intelligent” sensors are also located in that zone. First, you’ll need to attach the two stand bases with 4 screws. That’s easy. Alternatively you could purchase wall mount brackets (LSW240B, MSW240, or other 200×200 VESA brackets) to mount the TV against the wall. I placed the TV on a small furniture, and connected some HDMI cables, Ethernet, and the power cable. You’ll also probably want to wind the ferrite core around your Ethernet cable to reduce electromagnetic interference. After a few seconds, you’ll be greeted with a Welcome Screen asking you to press the wheel/OK button on the magic remote control. Accept General Terms, and Additional Services conditions. Interestingly all in Thai language, despite selecting English. Scan channels for Digital TV, Radio, and Analog TV. The TV signal is pretty poor in my room, and my Indoor antenna only allowed to be catch Analog TV channels. Once this is done the setup is complete, and you’ll be asked to go through a mini tutorial to learn how to use the magic remote control. Soon after completion of the settings, a windows pop to upgrade the firmware, so I went ahead, and testing everything with the new firmware. You’re now ready to have some fun. 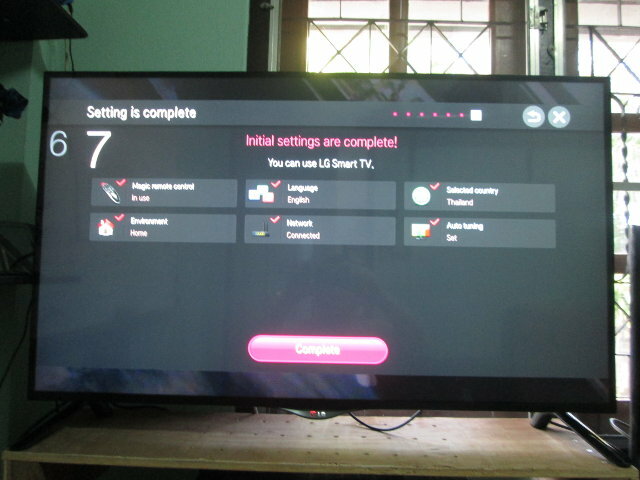 I understand LG has two user interfaces for its TVs: NetCast gets used in entry level TVs, and WebOS in higher models. Since I bought an inexpensive model (for a 4K TV), my model features NetCast 4.5. Pressing the home button starts the interface. 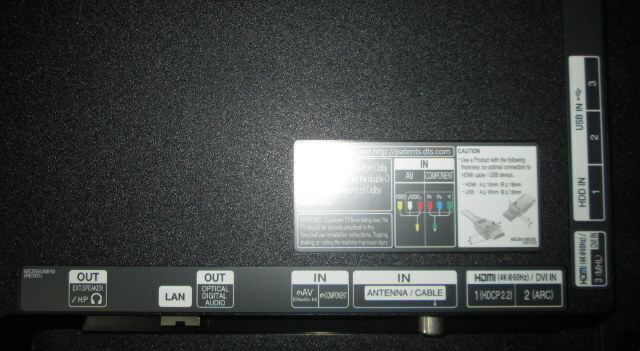 The top left section shows the current input (Antenna, AV, Component, or HDMI 1,2 or 3). The right part of the screen has some country specific “Premium” apps, LG Smart World app including an app store for free and paid apps, and SmartShare to access media from internal storage, a USB hard drive or flash drive, LG smartphone, or PC using the SmartShare programme. The company also provides a download Link to Plex server in that page fro Windows and Mac, so if they haven’t modified anything it might also be possible to use Linux distributions. I have not tried to connect to PC, and only use the USB hard drive to test video playback from the TV. Other settings include the Input List to select video input, and audio output. Video inputs include the antenna, composite, component, and the three HDMI input ports, while audio output options are as follows: TV Speaker, external Speaker/HDMI ARC), or LG Sound Sync (Optical). 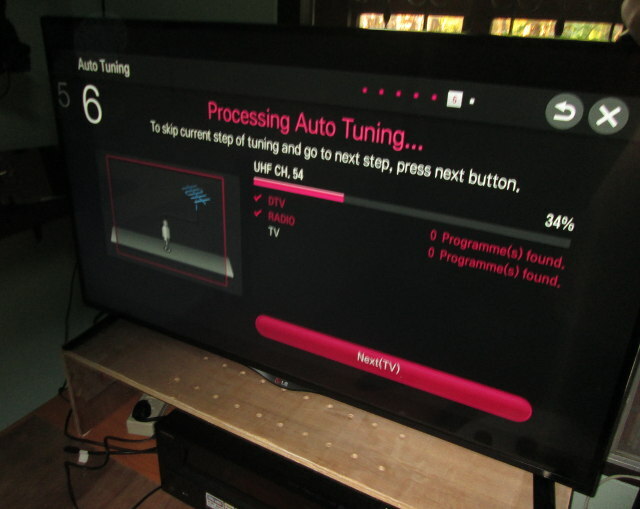 Time machine is the PVR function for the LG TV, and it works for analog and digital TV, but unfortunately HDMI input recording is not supported. I tried at both 2160p and 1080p with an Android TV box, but either the option is grayed out, or if you press the Record key on the IR remote, the TV clearly reports it’s an “Unsupported function in HDMI input”. The INTERNET icon will launch a web browser where you can either use a software keyboard or voice input and browse the web very much like in a PC. I invite you to check all this, as well as the full Settings, and a quick look at the user guide in the video below. The TV box I connected is Zidoo X9 which supports 2160p up to 30Hz, and it worked fine with the TV. 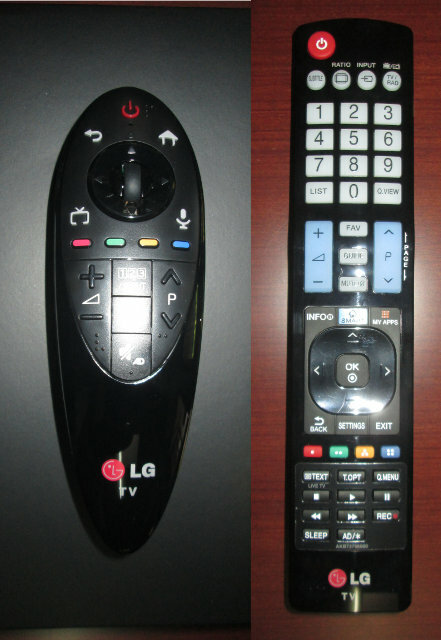 Just make sure, you press the “Ratio” button on the IR remote control and select “Just Scan” or the sides of the user interface will be cut due to overscan. I’ve also been told that since the TV only supports 8-bit / YCbCr 4:2:0, and not 10-bit RBG/YUV 4:4:4, so some HDMI 2.0 TV boxes may not work at 4K60 apparently due to limitations of some processors like Rockchip RK3288 that does not support YUV420 video output. Image quality is very good, and even at 1080p I find the image looks significantly better and sharper than what I get with my Panasonic TH-L39EM6T Full HD television. So there must be other improvements beside just the higher resolution. 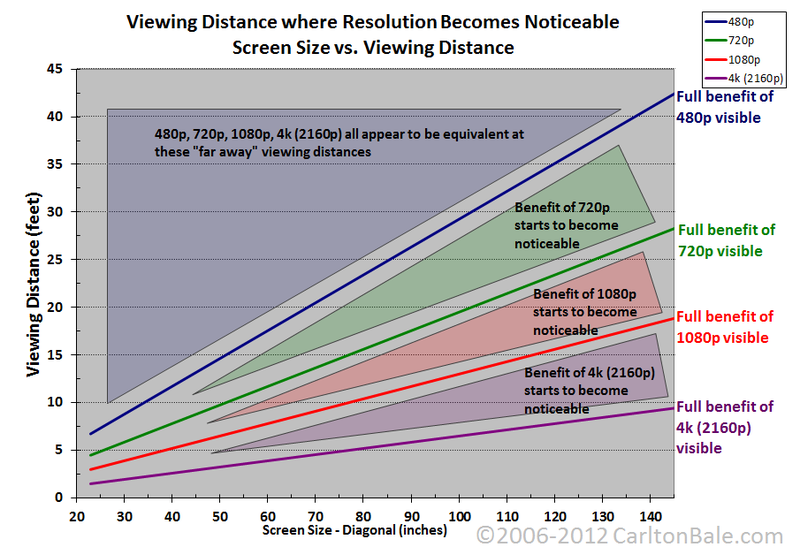 I’ll also just add a side-note here, as 42″ might be quite small for an Ultra HD television, as according to this chart, the human eye may not be able to distinguish the difference compared to 1080p further than 5 feet (about 1.5 meters). So you should really try to get one of the larger models if your budget allows it, unless you use the TV for testing (as I do), or as a computer monitor. I’ve gone through my usual list of video to evaluate video playback capabilities using the TV software (SmartShare) by playing videos from the NTFS partition of a USB hard drive. So you’ll definitely need to connect your TV to an AV receiver if you want to play these files. 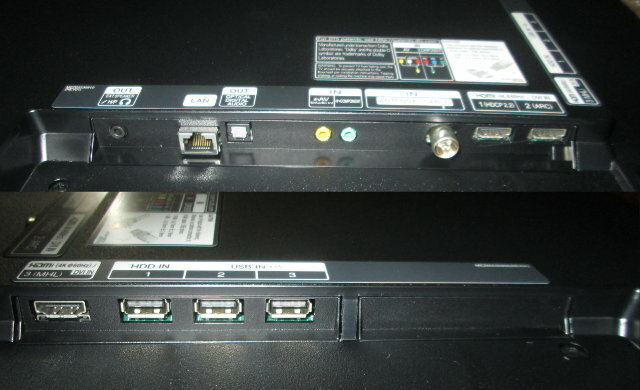 Since S/PDIF does not support TrueHD or DTS-HD, you’d probably have to use HDMI 2 with an ARC capable receiver. I could not play Bluray ISO since .iso file extension is filtered out. 1080i MPEG2 videos (GridHD.mpg & Pastel1080i25HD.mpg) could also play just fine. The TV software is usable, but most people may still prefer using an external TV box for video playback, and access to more apps. But overall, I’m pretty happy with the TV so far, with the main concern being the lack of (10-bit) RGB/YUV444 support via HDMI which could cause compatibility at 4K60 with HDMI 2.0 devices, but for that (and 3D) you’d need to look at models UB850T/V or greater. I know I have not covered everything, so let me know if you have further questions about the TV in the comments section. Update: I’ve loaded a 4K test pattern on the TV, and taken a close up picture as a reference when I test 4K TV boxes. Here’s the picture from my camera, and further zoomed below to verify one pixel indeed corresponds to one dot as it should be for a 4K display. 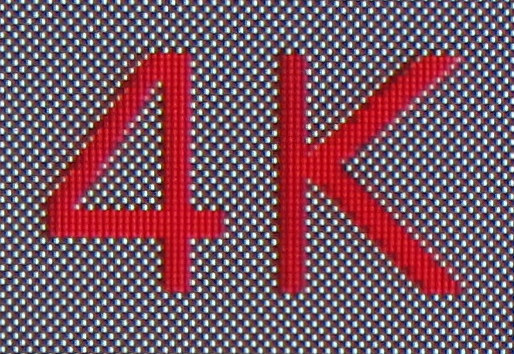 You can compare this to the picture taken from another 4K TV with a Rockchip RK3288 based device outputting 2160p, but rendering at 1080p as shown by the four pixels required to render one dot. The cheap antenna I bought actually work pretty well in other rooms, but in office it’s hard to get a clear signal except at very specific locations (It works with my DVB-T2 STB). Maybe I just need one of these USB powered signal booster. Joking aside, cannot wait to start seeing 2160p tests with different ARM implementations, to see which ones actually do the real 2160p (even if at only 4:2:0 level), end of course the magical combo with h.265 decode. More discussions about using the TV as a computer screen, 2160p 30Hz HEVC video decoding limitation by the internal TV decoder, and viewing distances. Odd that LG are selling 4K TVs with NetCast and have not fully moved over to WebOS yet. Tv seems to be exactly like mine except the IR remote is completly different ! Thanks for sharing some good knowledge, keep posting more information. There are several 42UB820 models. In Europe it’s 42UB820V, in some countries in Asia and Oceania 42UB820T (as above), etc.. 42UB820T supports DVB-T2. Normally, if your country supports ISDB-T, the TV sold in your country will support it, and it will not use some other standard that nobody can use. As long as your Blu-ray player supports 4K @ 60Hz in YCbCr 4:2:0 mode it should work. Have you tested this to run 4K @ 60Hz? I’m planning to get one and will be used primarily as monitor. I don’t have devices that support 4K60 as they should, so no. I have purchased the said model in Hong Kong but now I am using the same in India, my query is whether we can change the Software to local version. Do you use your model as a PC monitor? Do you think you could send me an email telling me if I should get this model or not? I try to play 2160p video from my external usb hard disk but there is shown in tv that video is not supporting format. So is there any other format of 2160p is supported or not from external usb drives? Sorry, I’m not sure. I’m only using Android TV boxes, or Linux or Windows computers with the TV, and never actually using the TV interface, except shortly in that review. Will this be upgradable to Web OS 2.0? I understand that it won’t. 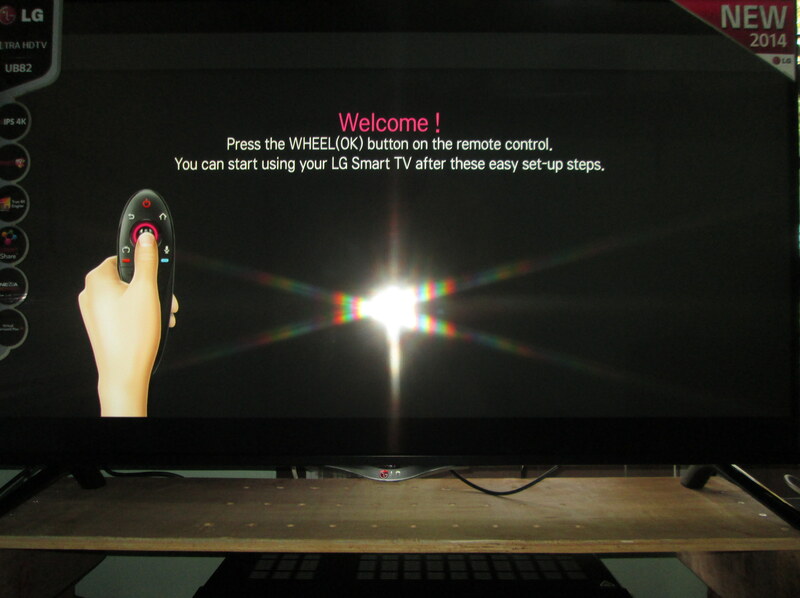 The CNET article (http://www.cnet.com/news/lg-updates-2014-tvs-to-web-os-2-0/) only states that WebOS 1.0 enabled TVs will be upgraded. Hi thanks for this great review. I am looking at buying the 49″ big brother of this model (49UB850T) to use as a monitor for my computer but I can not ascertain whether it has the HDMI 2.0 port that you claim this model does. None of the information I see online seems to indicate that it does. Are you able to clarify that for me. I plan to use it with a GTX-980Ti graphics card which has HDMI 2.0 out and it is really important that it has HDMI 2.0 and 4:4:4 chroma settings. Appreciate anyone’s advice to help clarify the above query. 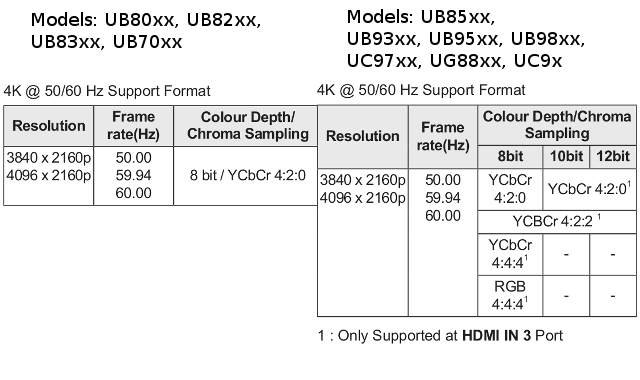 UB85xx models should support 2160p 4:4:4 chroma on HDMI 3 port. My seller has no clue at all. This model is not a UB85xx model though. 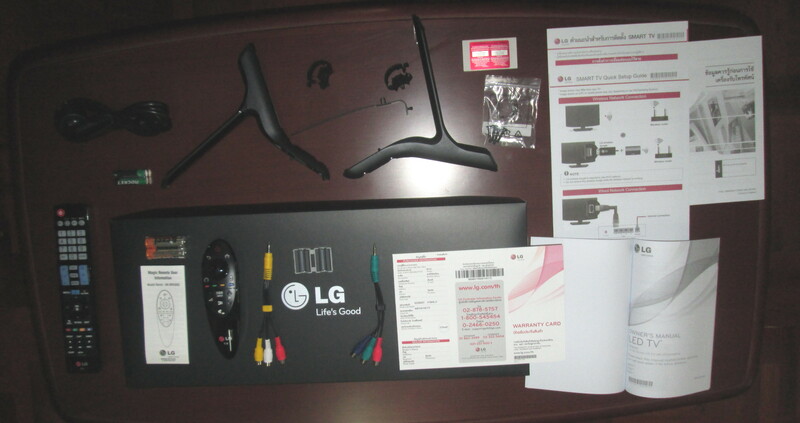 It is a LG 49UB830T which is the bigger version of the LG 42UB820T in the article. It worries me that there is no mention of HDMI 2.0 on the manufacturers website though (see below). Ah OK. In the first comment it was 49UB850T… But if it (49)UB830T then, according to that same table (which you should find in the user’s manual), UB83xx models only support 8-bit 4:2:0 chroma @ 2160p60, so if you need 4:4:4 chroma @ 2160p60, then you need another model. Thats a major bummer. I am struggling to get my head around what the info on the page in your link is saying. Is there any chance that you are able to tell me which models (or lines) I should be looking at to guarantee 4:4:4 over HDMI 2 that will work with my graphics card (GTX-980Ti)? I’ve just noticed I made a mistake in my first comment, HDMI IN 3 is the only one to support 4:2:2 chroma and 8-bit to 12-bit color depth, but 4:4:4 chroma with 8-bit color depth should be supported on HDMI port on models listed above in this comment including 49UB850T. It is highly likely (but not 100% sure) that your graphics card will also work with the cheaper 49UB830T model, but just with lower chroma sampling. Ok thanks for the assistance. It helps a lot. Just got this response from LG Singapore…. 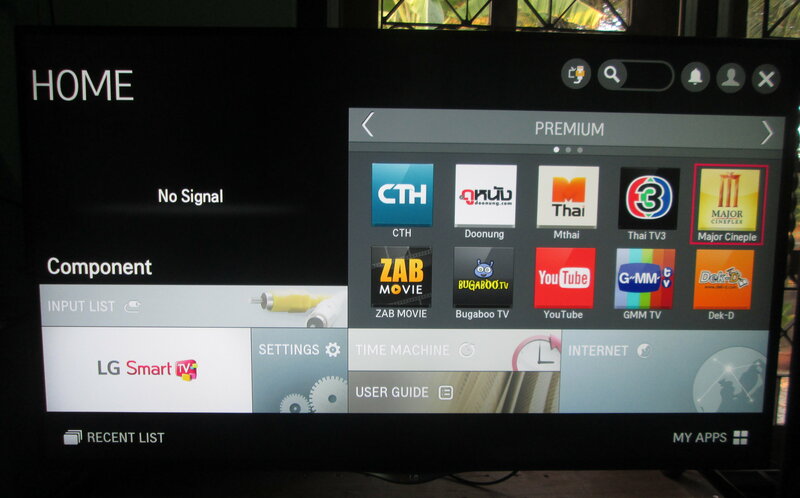 All LG TV’s from the UB & UF series support HDMI 2.0.
very in-depth review I am enjoying this TV in India for last 3 years now- but now I feel the need to download apps like Prime video. Hulu, hotstar on my Tv you have any idea how to do that ? Three years! Luckier than me then. I have not used the app interface much, but I don’t think you can download app so easily on the TV. Maybe better use a TV box instead. They usually cost $25 and up, but you’d need to check support for Full HD and 4K UHD in your app, and sometimes licenses get in the way.